Who’s that LPS girl? This fall, the LITTLEST PET SHOP pets will have the most stylish, world-traveling pet sitter in town with the introduction of the BLYTHE LOVES LITTLEST PET SHOP DOLL & PET assortment. In addition to trendy clothing and accessories, the BLYTHE LOVES LITTLEST PET SHOP doll has beautifully rooted hair and jointed arms, legs and head for realistic play. Each BLYTHE LOVES LITTLEST PET SHOP DOLL & PET set features one pet and one doll, both dressed for a day full of fun in fabulous matching outfits. Girls can choose from six different sets including FABULOUSLY VINTAGE, PLAYFULLY PLAID and COLD WEATHER CUTE. This collection marks the first time a doll is being introduced into the LITTLEST PET SHOP brand. Every set in the collection comes complete with a doll comb and stand and additional accessories for both BLYTHE and her pet. Each sold separately. Available at most major toy retailers nationwide and on HasbroToyShop.com. These MY LITTLE PONY figures feature characters based on the new animated series premiering on TheHub network this fall. Characters include TWILIGHT SPARKLE, PINKIE PIE, APPLEJACK, RAINBOW DASH, RARITY, FLUTTERSHY, and many more! All ponies in this collection include one pony figure, a brush, animal friend, and saddle. Available at most major toy retailers nationwide and on HasbroToyShop.com. We were sent a Rainbow Dash pony for review, and The Pea loves it! She loves combing out Rainbow Dash's silky hair. This new line of toys is based on the newest My Little Pony series, so they look slightly different from the older My Little Pony toys. They're a bit smaller and sleeker but no less cute. Actually, we quite like the small size because they're easier to carry around and store. If your daughter is a My Little Pony fan, this is a must-have collectible! Leave a comment on this post and tell me your favorite My Little Pony character, or your favorite Littlest Pet Shop character. This must be completed before any extra entries will count. 5) Join any of my other open 12 Days of Christmas giveaways (leave a comment with the name of the giveaway you joined, 1 entry per giveaway you've joined). This giveaway ends at midnight PST on January 17, 2011; I will draw a winner at random on January 18 and post the winner's name as soon as the winner confirms acceptance. For additional giveaway rules, click here. Good luck! Disclaimer: I received a My Little Pony figure for review. 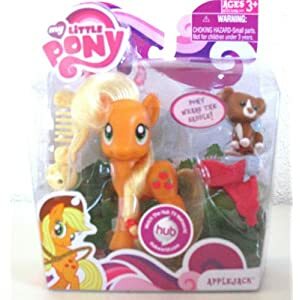 Thanks to Litzky PR for providing a My Little Pony figure and Littlest Pet Shop Blythe doll for the giveaway prize. The views and opinions expressed here are my own. My favorite MLP when I was little was Cotton Candy. I don't think she is in the new series, so my favorite in the new series is Apple Jack. Do the LPS have names? My favorite LPS is a chamelon that changes colors when held in your hand. I like the LPS Meerkat ... they weren't around when I was a kid so I enjoy them through my granddaughters. I posted on your fb wall. Day 8: Play-Doh Mega Fun Factory! Twilight Sparkle is my daughters favorite My Little Pony. My favorite my little pony is cheerilie....always thought it was such a cute name! I like MY LITTLE PONY STYLING PONY PINKIE PIE Pony. Pinkie Pie is a huge hit in our house. Apple Jack is my favorite My Little Pony. I am a Pinkie Pie fan! My daughter is nuts about both Littlest Petshop and My Little Pony! Thanks! How cute! They have a Decorate Your Own Pony on My Little Pony. And the MY LITTLE PONY Designer Pony (Junko Mizuno)is awesome. I love it. Lol. I got way sidetracked over there shopping for toys. My girl adores Pinkie Pie! It helps that her fave color is total pink. We own the old-school movies and this prize would make her day!! Entered the iLoveRobots Blazor dino raptor giveaway too! Minty is our favorite - thanks! My favorite LPS is the Hermit Crab. My favorite little pony is Pinky Pie. I love the Cupcake MLP! My favorite is Twinkle Sparkle! Pinky Pie is my fave and my daughters too. Chihuahua is my favorite Littlest Pet Shop character. I follow on GFC as sweetsue. Pinkie Pie is our favorite. I loved my little pony growing up. I had the stable and really liked Cotton Candy. My favorite Pony is Rainbow Dash, my daughter makes me play with them all the time! Did the mandatory entry earlier. Baby Heart Throb is my fav "My Little Pony" she's pink with dark pink red winged hearts. I love her because she always dreamed of singing on stage with Knight Shade. In real life, has dark pink hair and three (non-winged) hearts as her marking. She has a southern accent and so do I:). Her mother is Heart Throb;) She is my ALL-TIME FAV!!! I Follow Bonggamom Finds on Blogger (1 entry). I have entered "open" contest of your 12 Day's Of Christmas "Kymaro Curve Control Jeans" Which is the 10th day of Christmas contest! I have entered "open" contest of the 12 day's of Christmas Contest, Kymaro Essential Underthings prize Pack", which is the 11th day of Christmas Contest! My daughters favorite My Little Pony is Scootaloo. I am following via Blogger. Pinkie Pie is super cute! Scootaloo is my fav Pony. Cupcake from 30 years ago. Twilight Sparkle is my favorite MLP. My favorite MLP has always been Lickety Split because she's pink with ice cream cones. I used to love Blossom when I was a little girl! Cheerilie is one of my favorites. Thanks. Pinkie Pie is my daughter's favorite pony. My favorite Little Pony is Pinkie Pie...she's so cute! My favorite new MLP character is Rarity! My favorite MLP is Pinkie Pie!!! My favorite is Cotton Candy.